A free web based bingo card generator used by hundreds of people every day! Print-Bingo.com is a completely web based program for printing many types of bingo cards, including those with your own custom word lists. Since there is nothing to install, this site works with any recent computer and printer. Hundreds of people print bingo cards from this site every day, so chances are that it will work for you too! I've read enough. Let me generate bingo cards! We strive to make it as easy as possible to print your Bingo cards. Most computers have the proper software installed, so this site should 'just work.' If not, try the tips on the help page. Plus, since we're web based, you can print your custom bingo cards from any Internet connected computer. Start your designs at home and print them when you get to the office! You can even email your designs to your co-workers. 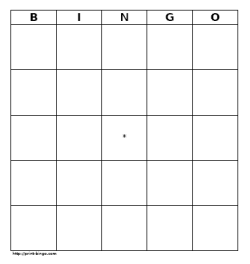 We offer three sizes of bingo cards, one, two, and four cards per letter sized page. We also have a custom bingo card creation form where you can create unique bingo cards with your own word lists and other customizations. Custom cards are great for teachers, buzzword bingo, or party bingo. Our site has unicode support, for you, this means that many, many, languages are supported, including Chinese, Japanese, and Russian. If our bingo card creation tools grows more popular, other sizes and customizations for our bingo cards will be added. Feel free to send suggestions or comments to bingo@perceptus.ca or leave a note in the print-bingo.com forum. So, without futher adieu, create some bingo cards.